The Photoshop Clone Stamp Tool is one of the oldest repair tools in the Photoshop Tools Palette. Whilst Adobe has duplicated and improved many of its features in newer tools, it remains very valuable. In this tutorial, I will explain how to use the Photoshop Clone Stamp. I will also demonstrate why this tool remains so useful for making repairs in certain circumstances. This tutorial is one of several I have developed, covering the different repair tools in Photoshop. Whilst the Clone Stamp Tool is very useful, you can often achieve the best results by combining tools. You also read my tutorials covering the Photoshop Patch Tool and the Photoshop Healing Brush/Spot Healing Brush Tools. In the following illustration, you can see the original image we will use for the tutorial on the left. This highlights two problem areas where the camera caught people at the edges of the frame; Genoa is a very busy city. The version on the right is the photo after repairing it using only the Photoshop Clone Stamp Tool. You can find the Clone Stamp Tool in the Photoshop Tools Palette on the left side of the interface. The following screenshot highlights this. Depending on your Photoshop interface configuration, your screen may look a little different from this. 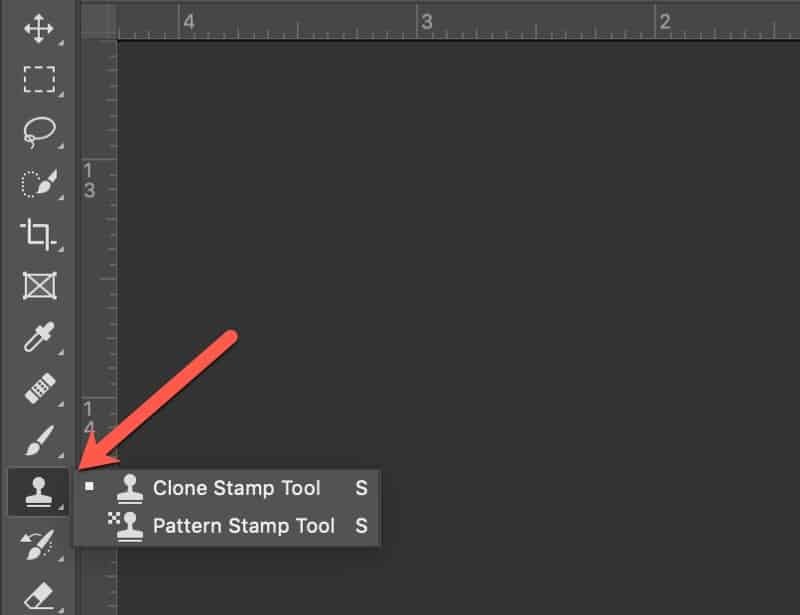 It’s possible that you have the Pattern Stamp Tool showing instead of the Clone Stamp Tool. If that’s the case, right-click on the tool’s icon in the Tools Palette. This causes the group to expand, allowing you to select the Clone Stamp Tool. Once you have the Clone Stamp Tool selected you will see its settings displayed in the Context Sensitive Toolbar. You can see a section of the Context Sensitive Toolbar displaying the settings for the Photoshop Clone Stamp Tool below. Here you can control the shape, size and hardness of the Clone Stamp Tool’s brush. I would recommend initially that you use a round brush. I also recommend you don’t set the size of the brush here but instead use the shortcut keys “[“ and “]” on your keyboard. The [ key reduces the brush size whilst the ] key increases it. It’s usually best to keep both at 100% unless you have a specific reason to reduce them. Sometimes you might want to blend multiple parts of the image together to help break up the appearance of patterns in a repair. Then it can help to reduce the Opacity of the Clone Stamp Tool. When you use the Photoshop Clone Stamp Tool, it works by sampling one area (the source) and copying it to another (the target). The Align option controls the sampling behaviour of the Clone Stamp. When the Aligned option is unchecked, the Clone Stamp Tool will always sample from the same part of the photo. It doesn’t matter where on the image you move your mouse; each time you use the Clone Stamp Tool it copies that same part of the image. You set the sample position for the Clone Stamp by holding down your Option Key (Mac) or Alt key (PC). When you do this, you will see the shape of the mouse pointer change. You then position the pointer over the area you want to sample and click once with your mouse. Release the Option or Alt key and the mouse pointer returns to showing the Clone Stamp brush. Depending on the version of Photoshop you’re using you will see the sampled area appear inside the brush as you move it. The alternative is to use the Aligned option. Setting the sample point for the Clone Stamp is still the same but when you click on the target, it sets up a reference back to the source. Now when you move the Clone Stamp Tool to another area of the image the source point also moves. How much is determined by where you place the mouse on the photo. The source position aligns to the new target position, which is determined by the first Clone Stamp Tool repair you made. The following screenshot should help to explain this. Here, I copied the area at point 1 from the sample at point 2. As the mouse pointer moves, the position of the sample also moves because the Aligned option’s selected. When I then click at point 3, it uses point 4 for the sample. Notice the relationship between points 1 and 2 is the same for points 3 and 4. They are the same distance and direction apart. 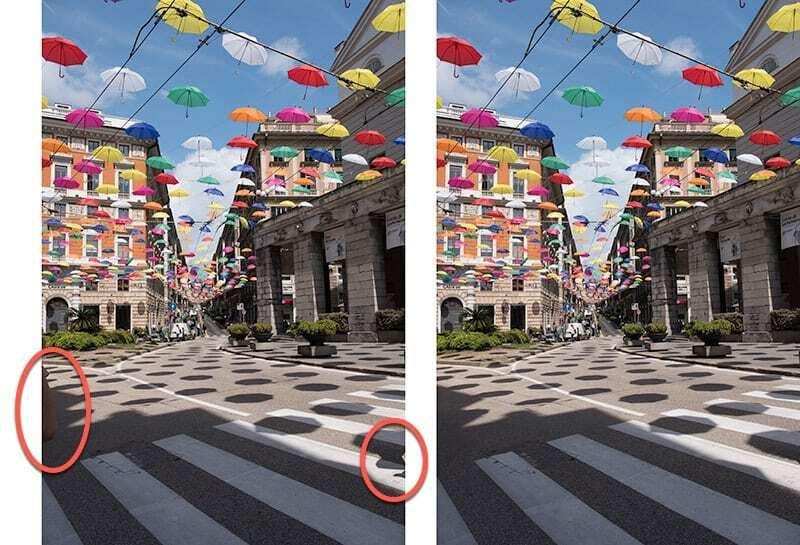 The Aligned option is about controlling the sample on the current layer of the image. But don’t forget, an image in Photoshop is three dimensional. The area you want to sample might not be on the layer where you want to make the repair. Current Layer – When you use this option, only the current layer’s sampled. That’s the layer you have selected in the Photoshop Layers window. Current & Below – With this option the sample’s taken from the current layer and any visible layers below it in the Layers window. If there are any layers above the current layer, the Clone Stamp ignores them. All Layers – This will sample from all visible layers in the image, irrespective of where they are in the Layers window. Being able to control this behaviour is very important because we can use it to make repairs on separate layers. The easiest way to do this is by adding a new empty layer to the top of the Layers Window by selecting “Layers | New | Layer…” from the menu. You can then set the Sample dropdown to be “Current & Below”. Now when you make the repair, the Clone Stamp Tool samples all the image layers and the repair’s made on the new empty layer. You could also use the “All Layers” option but it can cause more mistakes when working with lots of layers. In the following screenshot you can see the left side of our image magnified to 200% in Photoshop. 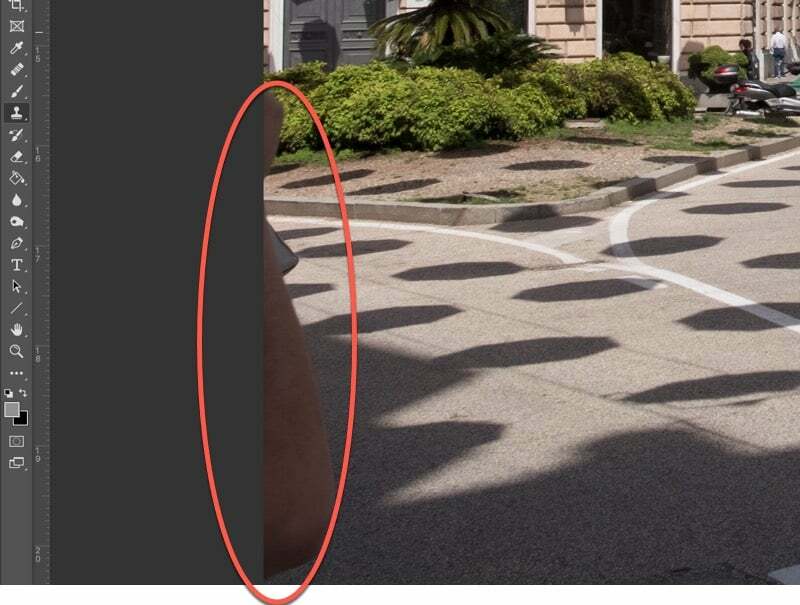 This highlights someone’s arm we need to remove from the edge of the frame. Given the detail surrounding the area, this is an ideal repair for the Clone Stamp. We can start the repair by creating a new empty layer using the menu command “Layers | New | Layer…”. Then check the settings for the Clone Stamp Tool in the Context Sensitive Toolbar. We create a hard brush with a slightly soft edge, by setting the Hardness to 90%. Set both the Opacity & Flow set to 100%. Also, use the Aligned option with the Sample dropdown set to Current & Below. Resist the temptation to dive into making the repair. Instead, plan out how best to produce a realistic repair. 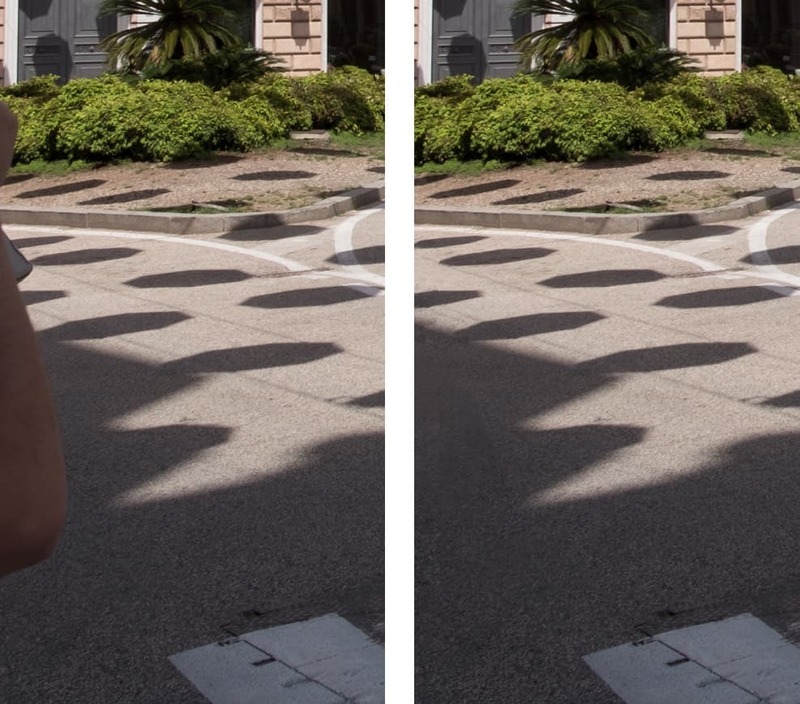 I’m going to start by reproducing the shadow patterns cast by the umbrellas. Once I have this in place, I can easily remove the rest of the arm as it’s all in the shadows. You can see my first repair with the Clone Stamp Tool in the following screenshot. Here I’m working at 200% magnification which is the minimum I would recommend when making repairs with the Clone Stamp. This allows you to work with enough precision to align repairs. 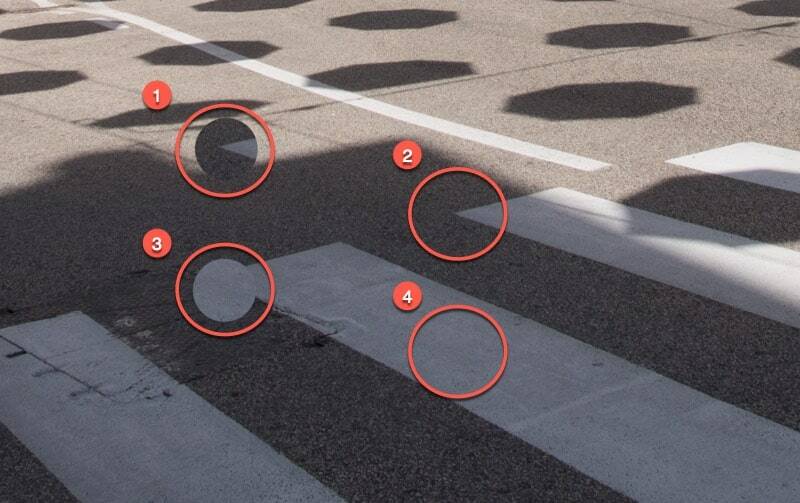 Notice in this example how the repair to area 1 perfectly aligns the shadows cloned from area 2. I can now continue to make repairs to the area around this by sampling other areas of the image. I’ll also be sure to increase the magnification as I work on smaller areas that require more precision. When doing this I’ll also resize the Clone Stamp Tool using the [ and ] keys on my keyboard. You can see the repair following this work in the screenshot below. Here the repair’s magnified at 300%. If it looks OK at this magnification it will look great at 100%. Removing the remaining part of the arm is now quite easy by sampling from the shadows around it. You can see the final repair below magnified at 100%. 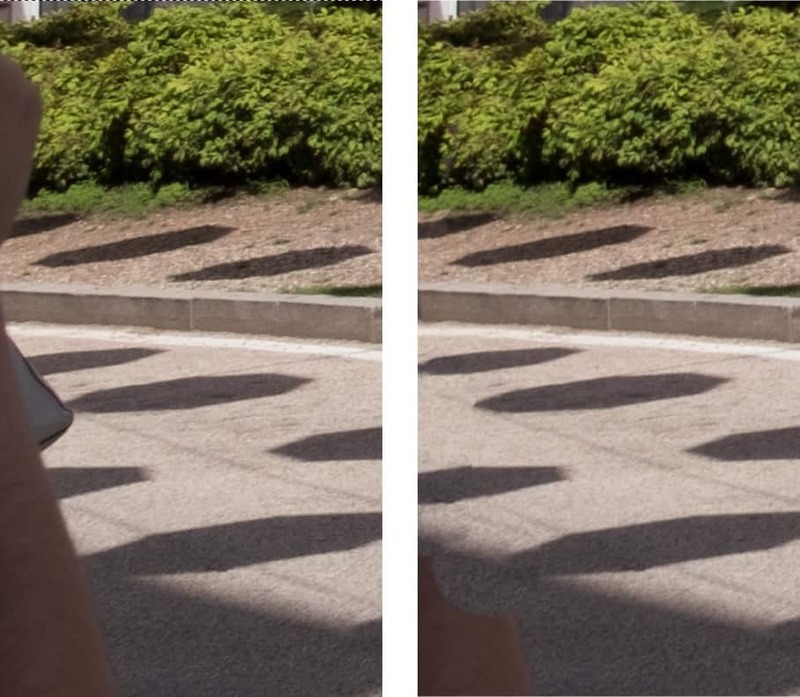 The original image is on the left and the repaired image is on the right. Using the Photoshop Clone Stamp Tool requires an understanding of the settings we have covered and a little planning. If you plan well, work slowly and in detail, you can create amazing repairs to remove unwanted objects. But it’s often not advisable to work with just the Clone Stamp. By combining the Photoshop Clone Stamp Tool with the Patch Tool and Spot Healing Brush you can usually achieve superior results. Be sure to read my other tutorials on these tools if you haven’t already.